Spring is such an exciting time of year, isn’t it? As the trees begin to bloom and new buds break through the gardens, they call us out of our homes and into the yards to prepare for the season to come. Fun in the sun is just around the corner, but for now there is a lot of work to be done. The long winter brought down to the ground what once was colorful foliage. The dead, dry leaves must now be raked and removed to make way for that which is to come. This cycle is simply a fact of life. If we want beautiful gardens, we must clean them out or else, no matter how lovely the new flowers, their beauty will be hindered by all the old clutter around them. Has your clothing closet become a junk room? When you look for an outfit for the day, is it easy? Or is your wardrobe crowded with clutter and chaos cause that cause your daily ritual to become a stressful decision? Let’s be honest, most mornings we do not wear the first outfit we pick. Not all of us can throw on any old jeans and T-shirt and be fine with how it looks. Natural Beauties may get away with that if their lifestyle allows for such simplicity, but they also have a tendency to hold onto things and are still susceptible to the Confidence Conflict that a crowded closet creates. It doesn’t really matter what size or shape your closet is, you can create an organized, inspiring sanctuary where you can start your day with simple decisions. The key is to be sure you have complete outfits, with nothing “unwearable” confusing your choices. In last week’s blog, we considered how sometimes simple Wardrobe Weeding is enough to keep your closet from clutter. Join my email list and I will send you my FREE WARDROBE WEEDING CHEATSHEET, Click here to get FREE PDF. When Wardrobe Weeding is not enough, and you need to start all over, it’s time to do a Complete Closet Clean Out. This doesn’t mean that you cannot keep anything you already have, but it may be time to step back and take a whole new perspective on your wardrobe. If you are like me, when you feel overwhelmed, you may need a nudge. Completely changing up your closet may seem like too much work, but I assure you that once you get started, you will feel inspired. I did my closet this week (thanks for the nudge!) and I feel so empowered by the simplicity of having less to wear. In truth, I don’t have any less, because most of the things I removed I couldn’t really wear–or felt uncomfortable or self-conscious in– anyway, and now I am free from their temptation to rob my confidence! Remove the misfits. Anything in your closet that does not help you get dressed for the day. If “wardrobe” does not define it; find it another place for it to belong. The ironing board can stay, but only if you have room for it; the broom and Christmas decor can not! Remove all the clothes. Yes, that’s right every stitch of clothing in your drawers, on the shelves or hanging up; take them out of the closet and put them somewhere that you can sort through them, piece by piece. I recommend pulling them out by “likes” and stacking/hanging them together in groups of slacks, jeans, skirts, etc. Clean. Vacuum, dust, wipe down every nook and cranny of your closet and dressers. Make it smell and feel inviting and inspiring. Ahh, now you can say, “look, honey, I have NOTHING to wear!” …or do you? Complete the outfit. That’s right, whether you are going out tonight or not (and you’ve got a lot to do, so I’d recommend clearing the calendar for the day) get dressed up–jewelry, shoes, purse and everything. Then take a selfie. When you are done with your Closet Clean Out you will have a whole album of selfies to remind you of #What2Wear next time you feel you have nothing. Purposefully put it away. With your first (and favorite) outfit, think carefully. As you undress, consider where each item should go. Place your shoes and jewels where they are visible. Carefully fold, roll or hang each clothing item so that they take as little space as the fabric allows without causing wrinkles. Place them in areas that make logical sense to you. You may want to keep the outfit all together or organize the items by size, sleeve or color. Note: For ideas and tips on how to organize your closet, please follow my social medias as I will be focusing on this all week. Repeat. Pick out another outfit and complete it with only clothing/accessories you have not yet put away. Take another pic and purposefully put away each item in that outfit. There will come a time when you need to re-use certain items to complete another outfit; that is fine, but try to create as many unique outfits as you can before mixing and matching. Continue doing this until you have created as many outfits as you need for your current lifestyle (in the current season). If you cannot complete enough outfits, make a shopping list of specific items you need. It’s a good idea to take a pic of anything you hope to match so that you can refer to it when shopping. Note: If you would like my Closet Audit Cheatsheet to help you with this, please comment or contact me and I will email you a great PDF chart that simplifies this. Eliminate the excess. Any clothes that are still laying on your bed that you simply do not want to put on, wether it is because they are uncomfortable, misfits, or make you feel self-conscious, get rid of (again, refer to your Wardrobe Weeding Cheatsheet Click here to get FREE PDF). Do not leave clothes out to disturb the peace in your bedroom. It would be silly to put in all this effort to create a Confident Closet only to make other areas of the house chaos and confusion, right? Cross the finish line. Decorate. Now, step back into/up to your closet and take a good look around. Chances are your heart is jumping for joy… and wanting to do the same thing for your husband’s side… (another day). Without all the extra clutter, what can you do to make this space more beautiful? Something that brings you peace and joy, like a picture from your honeymoon, a framed scripture, bouquet of flowers or simply the placement of your pretty purses?Note: I’ll be posting ideas this week on my social medias, so remember to check in. You did it! Now there’s only one more thing to do. Go, enjoy the fruit of your labor! Is there a woman in this world who has not faced this dilemma? We may have a closet full of great clothes, but if they don’t work together or fit well, then we still have “nothing to wear.” I suppose it’s not as big of a problem for men because their bodies (and their fashions!) don’t change as quickly as our’s do. Perhaps that’s why they just don’t get it. They have a valid point, though, when they question us on why we hold onto things we cannot wear. I have helped a lot of women de-clutter their closet. It’s what I do. Once you know your personal image identity, you want to rid your closet of any style that doesn’t compliment your authentic beauty. If you are a Bold Beauty and you wear lace, for example, you will not only feel awkward and frustrated, others will hesitate to trust you because the gentle impression that lace gives competes with your strong personality. This is the very reason you may put on a beautiful outfit that you love on the hanger (and your husband thinks “it’s fine, just wear that”) yet you cannot bring yourself to wear it out the door. But why do you hang it back up in the closet? This is the question that we attempted to unravel in my last blog. Today I want to share with you the greatest trick I have learned in helping women let go of that which they don’t want to get rid of. I have never once completely succeeded at weeding another woman’s closet. Every single client I have ever had has had trouble letting go of at least one item that was not a good fit for her. She doesn’t want to throw away the item because it still has worth in her eyes. She doesn’t want to give away the item because it has an emotional attachment. She doesn’t want to store away the item because she thinks her body will change again and doesn’t want to forget about it when she regains her figure. I tend to be non-confrontational. I quince when I watch how Stacy London and Clinton Kelly handle this in What Not to Wear. I know what it’s like to be on a tight budget and I don’t offer the credit card to go shopping with when I do a Wardrobe Weeding, so I have had to come up with another method of helping women transform their image by creating a Confident Closet. It has to fit. If you cannot put it on and feel good about how it covers your body and you refuse to put it the Give Away, Throw Away or Store Away piles (which we do during a weeding) then hang it up in an annoying spot until you can–or until you are ready to pick your pile. It has to be in good repair. If it puckers or pulls; is ripped, stained or missing buttons; if it rides, falls or splits in anyway that will make you feel self-conscious, then leave it out until you can fix it. Do not put it away until you do, and once it is in good condition, wear it. If you feel confident, keep it. If not, pick your pile. You have to complete the outfit. If you do not have anything to go with it, put it out somewhere annoying and do not put it back until you either find something to go with it, or you decide it’s time to let it go. You have to feel confident. If this item you love meets all the requirements above, then leave it in your closet, but wear it on the first opportunity you get. Make a commitment to yourself to decide by the end of the day if you are keeping that item or not. Am I comfortable? Or am I fidgeting with the fit? When I catch a glimpse of myself do I pull my shoulders back or drop them? How is my energy level? Do I feel empowered and aware of those around me or do I feel awkward and self-conscious? Is this “me” or do I feel like my mother? Is your Clothes Closet like your Kitchen? It’s part of every woman’s innate nature to desire beauty. Creating beauty, on the other hand, is not necessarily every woman’s forte. Every woman likes eating, too, but not all of us like to cook! Personally, I could go either way on when it comes to cooking. I like creating a meal for my family to enjoy, as long as I’m not too hungry to think and I have all the ingredients on hand to cook with. I love to go out to eat, too. It’s wonderful to have someone else create a scrumptious meal and place it right in front of me all prepared. At a restaurant they even do the clean up! Creating an outfit is a lot like cooking. What Makes a Bride Beautiful? She takes her father’s arm and enters the sanctuary as the entire congregation stands to their feet in awe. Her beauty captivates them, but their gaze does not distract her. Her heart is set on reaching the altar to stand beside the man she loves as they commit their lives to one another. It’s a beautiful moment, one that leaves an impression on the minds of each who witness it. Every bride should hear the sweet sound of her guests’ gasp when the doors open and she enters the room. It’s something most girls dream about. It’s also something many girls fear won’t happen. But it does. And it has little to do with the physical attributes of the bride. In fact, no stylist or fashion designer should ever take the credit for making a bride beautiful. The thing that makes a bride glow more than her form-fitted gown, her exquisite updo or flawless makeup is the knowledge that she is loved. A woman who feels loved feels confident and free. Confident that dreams come true. Confident that, with him by her side, she can face the world. Free to be herself because she is accepted, chosen, and wanted. It’s this poise that makes her stand up tall and float down the aisle in front of a congregation of people watching her. Confidence makes a woman beautiful. I can almost hear the thoughts of those of you who lost that poise after the honeymoon wore off. I know the lonely feeling of being married but not feeling loved. It made me ugly. Eighteen years ago I was given a second chance, and this time I realize that marriage requires maintenance just as my body does. If I stop exercising I get weak. If I don’t exercise love, my marriage gets weak. True love doesn’t just die; we let it. Love is a choice more than it is an emotion. Sometimes the best motivation to a good workout is to be in the gym with someone strong. If you want a strong marriage, get around another couple who is truly in love. Feelings follow actions. I’d blog more about that, but I have a wedding to get to. What a great time of year for a wedding on Cape Cod! I’m excited to be part of a multinational one this weekend. Working with a German bride has been so much fun! I don’t know if it’s her culture, her strong Christian faith or her beautiful temperament, but preparing a bride for her most photographed day is not always this peaceful and pleasant. 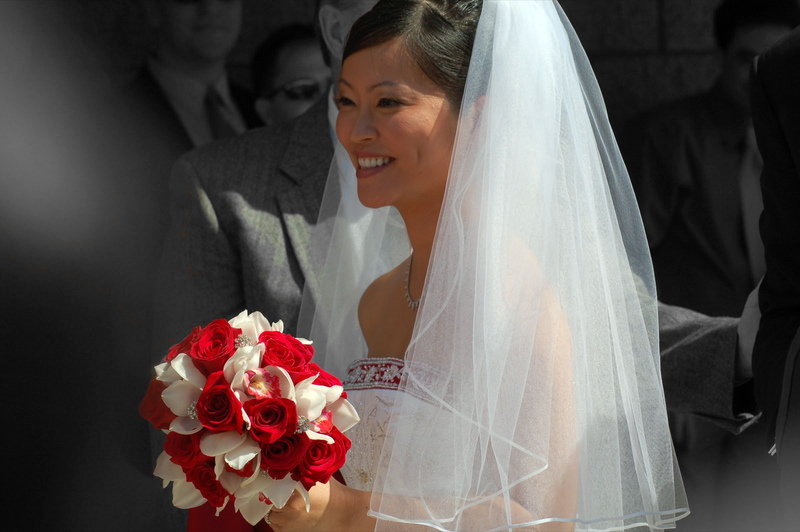 Weddings can be extremely stressful for women of any nationality–and not just for the bride. In some ways its even harder for the bridesmaids who will also be photographed all day. At least the bride pick’s her own gown. Well usually. Women who don’t get a say in their attire face some serious Confidence Conflicts. Formal events only intensify the image issues in a woman’s heart. At a wedding, the guest will gaze upon the bride’s beauty and she certainly feels that pressure, but her bridesmaids also have to walk down that isle with all eyes on them! This is especially hard when she doesn’t like the dress the bride picked out. The bridesmaid doesn’t really know (or know how to appropriately say) what she likes. It is culturally expected and accepted for the bridesmaids to give up their will for the bride’s. Personally, I feel bad about putting my Romantic girlfriends in Dramatic gowns, but honestly, I (like most young brides) didn’t know how to BE or LET BE when I got married. If I had, I would have followed the now popular tradition of allowing the girls to choose any dress in the bride’s chosen color. I love this tradition; it shows unity yet gives room for individuality. Unfortunately, it doesn’t solve the problem completely–unless the bride chooses a color that all her friends love. Which can be done if she chooses a neutral color that compliments all skin tones, but that’s a blog for another day. If you are getting ready to walk down the aisle in a wedding ceremony, I commend you for supporting your friend on her important day. If you don’t love your dress, remember that your confidence is what’s most beautiful and don’t let self-consciousness rob your joy. Focus on serving the bride well and enjoying the celebration.